know he will appreciate the same assistance and support you have given me. I am looking forward to the opportunity to return to being a “regular member” of the club and to be able to focus more on my carving. Tell from time to time. That is my goal. For one last time, Happy Carving !! Mohnsam, Mary Nowacki, and Alice Prahl. Members brought side dishes to accompany the ham sandwiches. send a card to the family. England, Chip Chats, and Woodcarving Illustrated. you still wish to attend the January 6th event. Saturday Carve. The project for December 5th was carving a Santa. The carve was held at the high school. available during the February meeting. vote getter and will assume his position in January. efforts to keep our club running smoothly. Show Admission. Willie VanSluys introduced the idea of raising show admission. Members voted it down. showed a brown bear. Bill Buelter completed two ribbons as a tribute to cancer survivors. Raffle. The 50/50 raffle was held. Winners were Larry Lienau, Gene Mathes, and Alice Prahl. a weatherproof finish since this tree is designed for outdoor use. The event will be held on April 9th at the Weill Center. doing the top and Pam Moir will complete the bottom. The theme for the blocks should center around Lakeland learning or sports. sheet is available if you wish to participate. 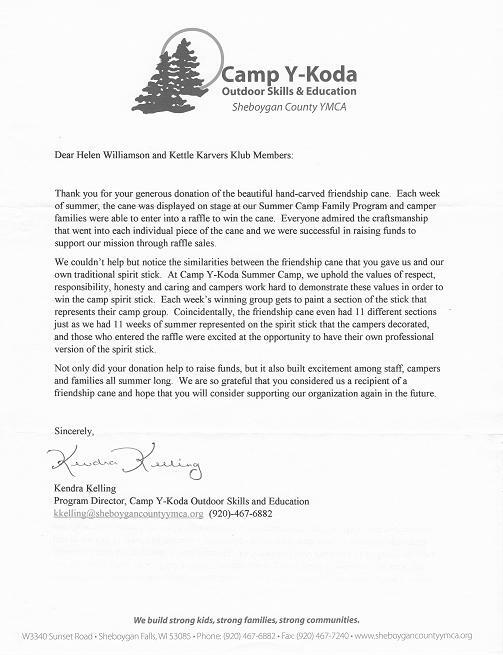 Click to see the letter received from the Sheboygan County YMCA camp. Saturday Carve — held once/month on the Saturday following the monthly meeting in the Generations Craft Room, 9 am-noon.